When ABC cast DAVID CASSIDY as its juvenile star in what became an astonishingly successful series, one of the most spectacular careers in the entertainment industry was launched. Before the end of 1970, the year that “The Partridge Family” premiered, David graced every teen magazine cover in the world, had the #1 selling single of the year, and garnered multiple Grammy nominations and won a Golden Apple Award. Over the next five years, membership of his official fan club exceeded that of Elvis Presley and the Beatles. Those were only the first of many records David broke in his long and constantly evolving career. He became the first personality to be merchandised globally. His likeness appeared on everything from posters to lunch boxes and cereal boxes. His concerts sold out in the largest arenas and stadiums in the world which led him to be the world’s highest paid performer at the age of 21. He broke box office records at Melbourne’s Cricket Grounds, London’s White City Stadium, Houston’s Astrodome and New York’s Madison Square Garden. To date, his records have sold well over 35 million copies worldwide and have been recognized with over 24 gold and platinum recordings including four consecutive multi-platinum LP’s. David was responsible for seven chart-topping Partridge Family singles including “Doesn’t Somebody Want To Be Wanted,” ”I Woke Up In Love This Morning,” ”Breaking Up Is Hard To Do,” and of course, “I Think I Love You”, the best selling record of 1971. As a solo artist, David has had hit singles including “Cherish,” ”Could It Be Forever,” ”How Can I Be Sure,” ”Rock Me Baby” and “Lyin’ to Myself.” His 2004 CD, “Then and Now,” was in the Top Five and reached platinum status. His next release, “A Touch Of Blue,” was comprised of material including covers and original songs. David sings in his unique style that has become more soulful and seductive over the years. Despite the superstardom he has enjoyed as a singer, David still thinks of himself as an actor first. His credits, from the phenomenal success of “The Partridge Family” also include the telefilm “A Chance to Live” the highest rated “Police Story” in its seven year history, which earned him an Emmy nomination as Best Dramatic Actor. He continues to be seen on television, guest starring in top-rated shows. Never one to rest on his laurels, he went to Broadway where he starred in the original production of “Joseph and the Amazing Technicolor Dreamcoat.” London beckoned so he starred at the prestigious West End in “Time” with Sir Laurence Olivier. In 1994 he once again broke box office records in the stunning production of “Blood Brothers”, starring with brother Shaun. The road tour of the United States and Canada was SRO. Always seeking new creative avenues, in 1999 David partnered with Emmy Award winning writer-producer Don Reo to create “The Rat Pack Is Back!” the first original production paying tribute to the legendary quartet. The musical played to sold-out audiences first at the Desert Inn, then at the Sahara Hotel & Casino in Las Vegas. For all 4 years of its Las Vegas run, the show received both critical and popular acclaim. It is currently touring in the United States, with regular stints at the Mohegan Sun, and David will intermittently return to the Las Vegas show at the Greek Isles. Simultaneously, David and Reo also created “At the Copa,” which David wrote, co-produced and in which starred. The show remained at the Rio in Las Vegas for one year after which, in 2001, David chose to return to his first love – touring in concert across the country and the world, something he had not done in almost 15 years. The success of his most recent recordings keeps his touring schedule quite full and has brought him back to the UK where the scene is reminiscent of the ‘70s. Interest in the superstar has led to an autobiography entitled “Could It Be Forever? My Story” (Headline Books), which shot to #4 on the bestseller list in England in just two weeks. His current CD, “Dance Party Remix” (180 Music/Universal Concorde), is a 21st century spin on his classic hits with newly recorded vocals and keyboard mastery by Craig J (Madonna, Kelly Clarkson, Mariah Carey), who is also responsible for the amazing dance mixes. The songs are getting rave reviews in clubs everywhere, bringing him a new generation of fans. There are also plans for David to return to television in a musical sitcom. In addition to performing, producing, writing and recording, David’s passion and avocation lie with the thoroughbred horses that he breeds and that race at tracks throughout the country. David lives in Florida with his wife, songwriter Sue Shifrin-Cassidy, and their 17 year-old son Beau. Do you want to hire David Cassidy? Directly request a quote. In 48 hours we can send you the availability of David Cassidy If you would like to book David Cassidy, Entertainment Booking Agency is the right place. 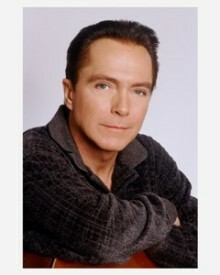 We will offer you the best price and contact the management or we directly contact David Cassidy. For corporate appearances or speaking engagements you can contact our agents and the will help you true the process. Tags: hire David Cassidy, David Cassidy booking, book David Cassidy, David Cassidy appearances, find more information on booking David Cassidy for appearances, David Cassidy speaking engagements, David Cassidy endorsements/spokesperson, David Cassidy appearance fees, David Cassidy booking agency contact info, biography of David Cassidy, Contact an artist booking talent agent find a speakers bureau that can book David Cassidy, speaker booking agency for David Cassidy, David Cassidy booking agency, David Cassidy booking for corporate event. EBA is one of the biggest entertainment booking agencies in the World. We book hundreds of celebrities, artist, athletes and speakers in a year. Important to know is that we are not claiming to be the management of David Cassidy. We are not the official agent for David Cassidy. Companies from around the globe book these artists and speakers true our company be course we have one of the biggest networks and we always have direct contact with the artist or the management. We help you to find the right celebrities for your corporate of private events. Please contact one of our agents to get free advice and we will help to get the world-famous artist on your party.